Singer, guitarist and songwriter Chuck Berry, a giant in the history of rock ’n’ roll whose turbulent private life was marked by a rocky relationship with the legal system, died Saturday at the age of 90. The St. Charles County Police Department in Missouri confirmed Berry’s death in a Facebook post. Officers responded to a medical emergency in a home at approximately 12:40 p.m. First responders could not revive Berry, and he was pronounced dead at 1:26 p.m. The cause of death was not known. Berry’s ability to draw in white teenagers without alienating his core black audience—the first black rock-’n’-roller to do so—led to his tremendous crossover success. He became known for the flair and showmanship of his live performances, which featured his famed “duck walk” along with an infectious mix of rhythmic blues and country with a dash of witty lyrics. Berry, always a shrewd businessman, reveled in his wealth and fame, opening Berry Park, a custom-built estate/amusement park in Wentzville, Mo., in 1957. The property had a guitar-shaped pool, golf course, hotel rooms and a nightclub. He also steadily built his beloved fleet of Cadillacs. Such tunes, however, were not enough to maintain Berry’s popularity in the 1960s against the tidal wave of new young artists like the Beatles, the Rolling Stones, Eric Clapton and Jimi Hendrix. The Beatles even recorded versions of his classic songs, including “Roll Over Beethoven.” Berry switched to Mercury Records in 1966 to boost his career, but the move did little to help. He became a regular at rock-revival tours but ended up having his biggest hit in 1972—his only No. 1 hit, as it turns out—with “My Ding-a-Ling,” which sold 2 million copies. 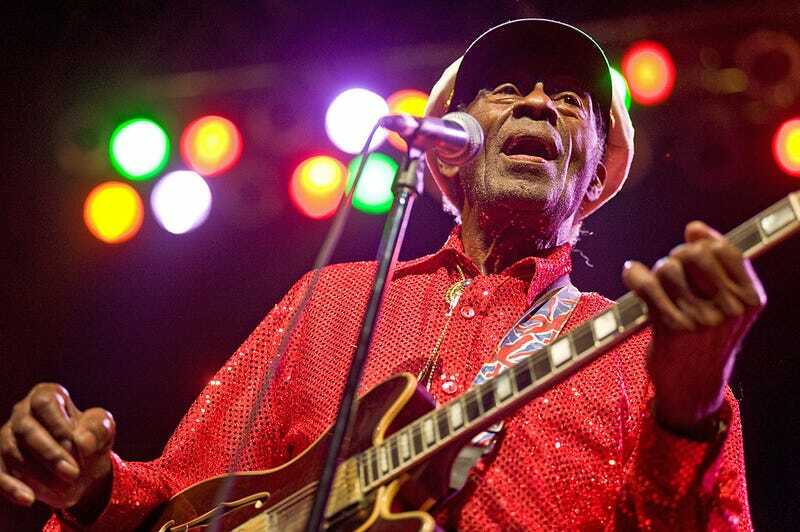 Berry, a complicated, hugely charismatic man, could also be moody and not always easy to work with, which comes across in the re-release of the 1986 film Chuck Berry: Hail! Hail! Rock ‘n’ Roll, a documentary of a concert celebrating Berry’s 60th birthday. In the introduction, director Taylor Hackford says that Berry “wasn’t always cooperative.” In subsequent interviews, producers and crew members—along with musicians such as Stones guitarist Keith Richards and Bruce Springsteen—shared their own perceptions of and experiences with Berry as a man and a legend, and the personal stories weren’t always flattering. The evidence of Berry’s onstage performance, however, makes it clear that his peerless skills as an entertainer were never in doubt. In 1979 he landed in a California prison for failing to pay income taxes. Berry faced more legal troubles later in life when police raided his estate in 1990 on tips that he was selling cocaine; the charges were later dropped. He also settled out of court a class action lawsuit by women who claimed that they had been videotaped in bathrooms at Berry Park without their consent. The problems in his personal life did not stop Berry from receiving his share of accolades for his massive contributions to music. In addition to receiving a Grammy Lifetime Achievement Award in 1984, he was among the first musicians to be inducted into the Rock and Roll Hall of Fame, in 1986. Berry received Kennedy Center Honors in 2000, and his name and music regularly appear on Rolling Stone magazine’s “Greatest … of All Time” lists, including the 100 Greatest Artists (No. 5), 100 Greatest Guitarists (No. 6), 500 Greatest Albums (No. 21) and 500 Greatest Songs (Nos. 7, 18, 97, 129, 277 and 383). “Johnny B. Goode” also took the No. 1 spot in the 100 Greatest Guitar Songs category.